furniture especially in wooden table. We manufacturer all kind of Thacket Table like Thacket Dining Table, Coffee Table, Side Table, Lamp Table, End Table, Nest of table and all kind of furniture. Our products made by sheesham wood, hoardwood, mango wood. 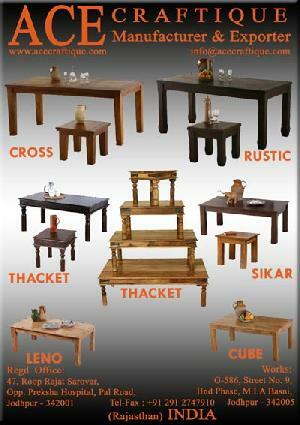 Our New Launched Products Thacket Table have well shine display with solid hardwood. Interested Costumer contact us send your contact detail so that i can send u all detail. ACE CRAFTIQUE is a well-known manufacturer and exporter of all kind of Handicraft Products like, wooden furniture, ironware, wrought iron furniture, traditional and artistic range of handicrafts, ethnic items, textile etc. The company caters to quality conscious international markets of Europe, USA, UAE & Asia.